Chili, La Plata and part of Bolivia. 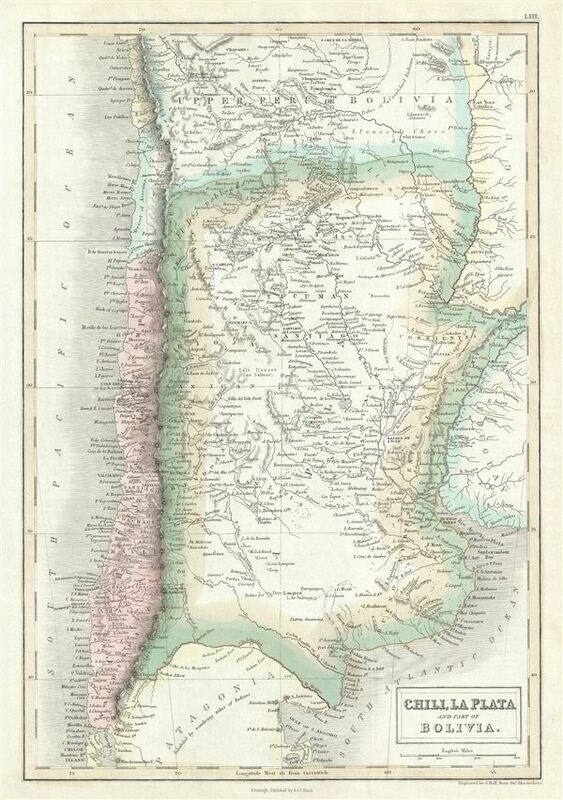 This is a fine example of Adam and Charles Black's 1851 map of Chile, the Argentine Republic and part of Bolivia. As this map being drawn most of South America was tenuously emerging from the many South American Wars of Independance. The map further illustrates Bolivia's claims to the Atacama Desert and a narrow strip of Pacific coast that is today part of Chile. Various towns, cities, mountains, rivers and several other topographical details are noted with relief shown by hachure. This map was engraved by Sidney Hall and issued as plate no. LIII in the 1851 edition of Black's General Atlas of the World. Rumsey 2305.063 (1854 edition). Philips (atlases) 4334.